When you need illumination in your outdoor area, dusk dawn outdoor lighting will help you have light when you need it without having to do anything. All it takes is a sensor to interrupt the power to your light fixture during the daylight hours. If you are just looking for light or style these examples will give you the feel and security that you are looking for. Lets look at some different examples and then explain how it works. This is the traditional security light for parking lots. If you have a large area that will need light all night long this is the fixture for you as it can cover 10,000 square feet per fixture. The 70 watt High Pressure Sodium bulb will give about 6,00 lumens of light. The bulb life is about 18,000 hours, this is good because of the high price of a replacement bulb. The Dusk to Dawn sensor is located on the top, make sure that it will get enough sunlight to turn off during the day. Photo cell can be replaced. The fixture is 14 inches tall and 10 inches around. It will protrude 13 inches away from the wall when mounted. It will weight about 5 pounds, this will require it to be solidly mounted to the wall. Does not mount to an electrical box. This is the same as most people have on their back or basement exit. The fixture is matte black with a jelly jar type globe hanging down. The big difference is the dusk to dawn sensor. It is located on the top for the light to be activated when it is dark. 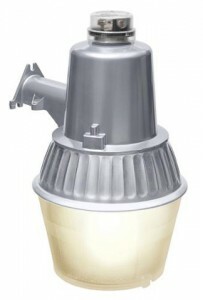 The fixture has a max rating of 60 watts for a regular incandescent bulb. Other styles of bulbs will fit, you will have to make sure it will fit inside the jelly jar glass enclosure. The fixture is 7.25 inches tall and 6 inches around. It will stand 7 inches away from the wall when mounted. 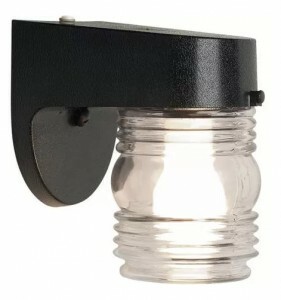 At 1.5 pounds it is a very lightweight fixture and will have no special mounting needs. It will mount directly to any wall electrical box. If you are looking for something a little more decorative this coach light fixture may work for you. The fixture is painted matte black with decorative glass on four sides. The light sensor is on the top of the mounting plate. The photo cell is made into the fixture and cannot be replaced. The single bulb with a maximum of 60 watts will be needed. No disassembly of the fixture is need to change the bulb. The fixture is 12.5 inches tall and 6.5 inches square. It will be 7 inches away from the wall when mounted to an electrical box. It has wiring that is easy to install for anyone. A little different in that it uses LED for lighting this Brinks fixture will use less electric than any of the other fixtures in this post. The integrated photocell cannot be replaced. The rust resistant frame has a bronze finish. The clear plastic lens can be removed for cleaning. The light comes from 8 super bright LED's with a 2,000 lumens total output. You can expect around 50,000 hours of life from this fixture. This bright light will only use around 34 watts of energy with the output of a 125 watt bulb, saving money over a regular incandescent bulb. The fixture is 5.5 inches tall and about 7.5 inches wide. It will stand about 10 out from the wall when mounted. Some customer complaints about radio frequency interference that is caused by the power supply for the LED bulbs. It can interfere with radio clocks, cable modems and other electronic devices in your home. This is a coach light design of lantern. The durable metal frame is finished in an Antique Bronze and has flat glass on the four sides. The photo cell is built in the top of the unit and cannot be replaced or serviced. 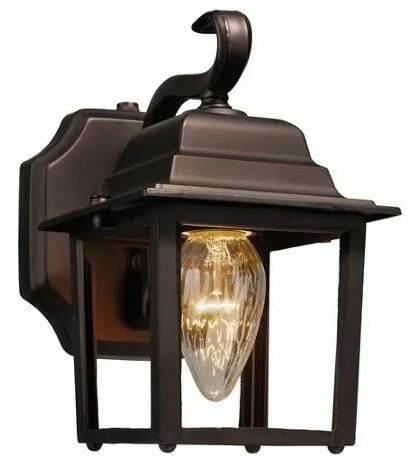 The 60 watt bulb is the maximum rating for this dusk dawn outdoor lighting fixture. Bulb is not included in this fixture. Installation can be a little tricky when installing one these dusk dawn outdoor lighting fixtures. Make sure the sensor will get proper sunlight or your light will shine all of the time. Some of these fixtures have extra wires for the photo cell to work off of. Some will have the power to the photo cell then to the fixture. Make sure you read all of the wiring directions before installing. If you have any questions, ask a qualified electrician before installation. You can install on an off/on switch for further control. The photo cell will read the amount light that is available and when the light is at the minimum it will allow the fixture to slowly turn on, the light does not progress to an instant on like a light switch. When the light level is increased the fixture will cut off the power to the light. None of these fixtures have an adjustable sensor. Check the wiring diagram before installing these fixtures as some requirements are different that a regular fixture without any sensors. Make sure you check with the manufacture when looking at different bulbs for you fixture. When you involve a photo sensor in line with some bulbs it will cause it to flicker and burn out faster. I recommend only using a normal incandescent light bulb in these outdoor light fixtures, except for the High Pressure Sodium bulb. If you use LED bulbs, use the dimmable variety, it will last longer. Hope you have found some of this information on Dusk Dawn Outdoor Lighting helpful. There is a wide variety of fixtures and illumination to choose from, not every fixture is going to work for everyone. Be careful when choosing the light bulbs for your fixtures as the dusk to dawn sensor can make your bulbs have a very short life. Thanks for reading my post and if you have any questions or comments use the form below. wow those are awesome choices! I like how there is a bit for everyone here. I am impressed by the first one that covers up to 10 000 square feet! That is a lot for a single light bulb! I like the style of the Hampton Augustine lantern. It has a very classic look while being practical. And finally I think the Brinks LED is a wonderful eco friendly choice. This is a wide variety so that there should be one design that would fit everyone’s taste. All of these examples will have an advantage in there type of lighting. The LED light is very eco friendly, it does have its shortcomings though. These all look so familiar! I guess it’s because I see a lot of them on houses around my neighborhood. Apparently I live in one of the richest neighborhoods in my township. So I see really niche dawn to dusk lights all the time. My house has the cheap ones.. actually they are just really old but they are glass diamond type shapes. My favorite looking one is the Hampton Augustine Lantern Dusk To Dawn. It’s SICK! where can i buy this for my future home? 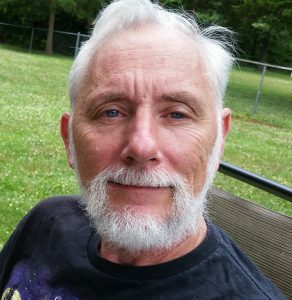 Follow one of the links in the post to look at what is available and what price it is today. The Hampton is one of the best looking in this list. Yes! I love the idea of dusk to danw lighting as well as motion sensor lighting. You can set it and forget it – the light will get the job done when it’s needed. My personal favorite is the Hampton Augustine Lantern Dusk To Dawn. And it’s not because I lived in St Augustine, Florida, and there was a Hampton’s Inn nearby. True story. I kid you not. Nice that I could include some of your local landmarks in my post. That is one of the best things about these lights, you install them and adjust them, then you are done until the bulb burns out. Ya I have to agree with others on the Hampton. That is an awesome looking light. I will look to upgrade to that style in the future. Thanks for providing these great choices John. Well done! 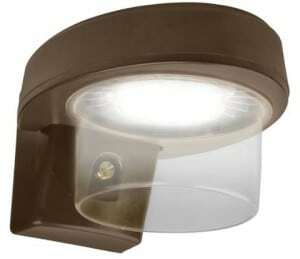 All of these styles of lights have a place in outdoor security. Each one will work in their own way to provide the security that is needed. You first have to find out what your needs are then go to the bin to find out what is available. These lights would be really good for someone (like me) who has difficulty seeing 2 feet in front of them when it’s dark. I rely on the torch on my iPhone just to get from the bedroom to the bathroom at night. Some of these babies would be perfect from the carpet to the front door for when I arrive home late. I really like the modern look of the Jelly Jar lights. The jelly Jar lights have been around a long time. I remember them from when I was small on the back porch. Having a dusk to dawn switch makes this fiture so much better for those who come home after dark or during the winter months when the sun goes down early in the evening. So many choices. I think I am going to go with the modern style. You mentioned about the photocell that can be replaced or not. How often does it break? Is it a feature that I should consider in buying these lamps? As with any electrical component, any thing can break. Most photocells outlast the fixture that they came with. My front yard flag pole light has had the same Photocell for three fixtures. This is just one of the features of the Brinks High Pressure Sodium Dusk to Dawn Security Light. None of the others have a photocell that can be replaced. This fixture is more for commercial use or for an entire parking area. I love many of the fixtures that you have chosen to showcase in your post of how to find dusk to dawn outdoor lighting. I love the idea that these light address the issue of light being security and come on by themselves. Without light we leave ourselves open to the opportunity for bad things to happen (being mugged, walking into something or stipping. Very nice post, I especially like the Hampton Augustine lantern. 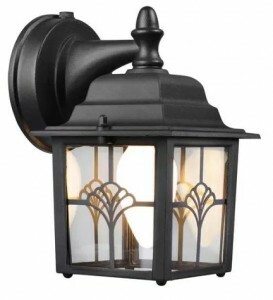 The Hampton Augustine Lantern is very charming and will fit the decor of many homes. It does not produce the most coverage, it just looks good if is on or off. The big advantage is that if you wanted other lights in the same outdoor area you could get some in the same design with different lighting options. We have a parking area near some houses we let and the residents have often said it would be nice if was lit up at night. I was thinking about installing a motion-activated light but now having seen your post I feel that dusk to dawn lighting would probably make them feel more secure. Do you know if there are any solar powered dusk to dawn lights that could do the job? I know they wouldn’t give off the same light as an electric light but it could be a solution as the only place I could take the electricity is from the residents and that causes complications. Thanks for your post there are some great looking lights here. The Solar Security lights work better with a motion sensor. The Rechargeable Batteries cannot hold enough charge to keep the high powered bulb lit for the entire night. If you want a Dusk to Dawn, the better choice is the line voltage fixture.